1. Wash the bitter gourd and slice them into thin rings. apply it on both the side of sliced bitter gourd. Set aside. tray and bake them at 360 F for 10 min. 4. Broil each side for about 2-5 min until they are golden brown. 5. 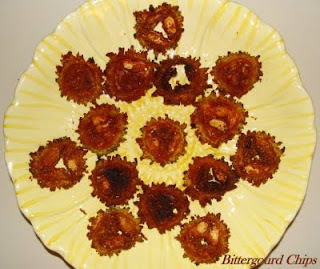 Crispy Bitter gourd chips are ready to serve. Shubha, even I like this chips.